Warren Moon, a Seattle sports icon, is the latest in an expanding list of nationally prominent men to get sued for sexual harassment. 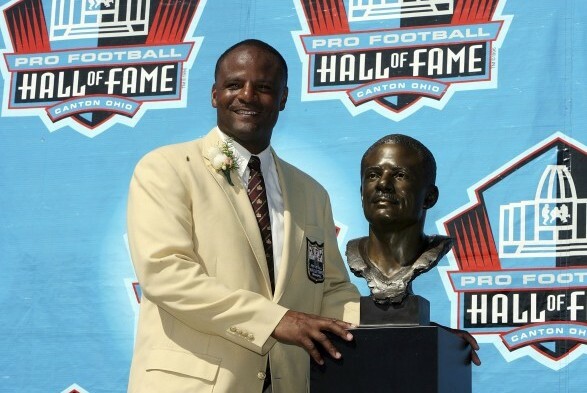 A California woman, employed by a sports marketing company led by former University of Washington and Seahawks quarterback Warren Moon, has filed suit against the former football star and current broadcaster accusing him of sexual harassment. According to the Washington Post, which first reported the story, the suit was filed Monday in Orange County, CA. The suit alleges that Moon, 61, a member of the Rose Bowl and Pro Football halls of fame, required the woman to wear thong underwear and share his bed on business trips and that Moon committed sexual battery by grabbing her crotch during a trip to Seattle this year. The suit also accused Moon of ripping off the woman’s bathing suit and drugging her drink during a separate trip to Mexico. Late Wednesday, Moon requested a leave of absence as the club’s radio analyst. The Seahawks accepted his request and issued a statement, attributing it to an unidentified spokesperson. Plaintiff Wendy Haskell, 32, who gave permission for the Post to publicly identify her, was hired as Moon’s executive assistant last July and traveled with him to speaking engagements, personal appearances and charity events. Haskell said she was demoted by Moon’s firm in October when she complained about his sexual advances. Moon was Pac-8 co-Player of the Year in 1977 when he led the Huskies to the conference title and a win over Michigan in the Rose Bowl, in which he was MVP. Moon played six years in the Canadian Football League for the Edmonton Eskimos, winning five Grey Cups, before signing with the Houston Oilers (now Tennessee Titans) in 1984. He spent 15 years in the NFL with Houston, Minnesota and Seattle, playing for the Seahawks in 1997-98. He finished his career in Kansas City (1999-00) and retired in 2000 after 17 seasons at age 44. Moon never played in a Super Bowl, but was named to nine Pro Bowls during his career (Pro Bowl MVP in 1998). He threw for 49,325 yards and 291 touchdowns. He made the Hall of Fame in his first attempt in 2006. Moon won the 1989 Walter Payton Man of the Year award, but scandals involving women dogged him later in his career. In May, 1995, he was sued by a Minnesota Vikings cheerleader, who accused him of sexual assault. That case was settled out of court. Also in 1995, Moon was arrested in Texas after his wife, Felicia, told police that Moon slapped and choked her during an argument. Ultimately, Felicia Moon declined to press charges, but authorities charged Moon with assault anyway. He was acquitted by a jury. The couple divorced in 2001. Moon founded Sports1 Marketing in 2010 and, in addition to working as a radio analyst on Seahawks broadcasts, serves as its president. According to Haskell’s lawsuit, Moon demanded that she stay in his hotel room during business trips, sleep in his bed and wear skimpy thong lingerie bottoms. The suit states that when Haskell protested, Moon told her she had to comply to keep her job, adding that his previous assistant accepted the same arrangement. Moon is the first African-American quarterback inducted into the Pro Football Hall of Fame. He is also a member of the Canadian Football League Hall of Fame and Husky Hall of Fame. Damn it. All my heroes are proving all too human. Are we witnessing the death of the groupie? A few years ago American women were devouring and enthralled with 60 million copies of Fifty Shades of Grey and now this. The boys in the band had their pick of new short lived love, professors were entitled to a fresh coed each semester, life guards could choose their bikini, NBA and NFL team hotel bars were well stocked with willing ears, stage mothers willingly sent their daughters to the casting couch…maybe the Bandito and Hells Angel’s b**ches will keep a flicker of the flame burning. Obviously, unusual and very questionable job expectations on the part of her new employer. What happened to quitting on the spot when being informed of these expectations, prior to any compliance with those demands? Certainly, the demands themselves constitute a form of sexual harassment, but I’m puzzled that she chose to continue to work there when she knew that was the expectation. Everything is guesswork at this point but most likely at the time she started her job she wasn’t informed about any intimate expectations and certainly didn’t know what to do when it involved a major sports icon. Many abuse victims have done the same. Assuming her claims are even remotely true she should be applauded for coming forward. not to condone outlandish behavior, but I was thinking the same thing. Also knowing that they’ve known each other for a couple of years tells me she shouldn’t have been at all surprised (if the accusations prove true) Still seems too kooky to me. These accusations boggle my mind. Either this woman is lying through her teeth or Warren is the biggest moronic pervert in the world.